uuid : 2eaaebf4-c737-41f7-8484-fd4f1a0bfefa templates_id: 119500 templates_uuid: "b0ea79df-2d9b-4bcc-b360-feb4f344da32" title: "Environmental policy - Environmental statement " display_name: "Environmental policy" meta_keywords: "environmental statement" description: "
Outline your commitment to managing the environmental impacts of your business using this environmental policy. A good environmental policy can help you manage your resources, achieve cost savings and promote more environmentally friendly practices. Our environmental policy includes statements on reducing the environmental impact of your people, activities and operations. You can monitor your environmental practices and their effectiveness by regularly reviewing your environmental policy. 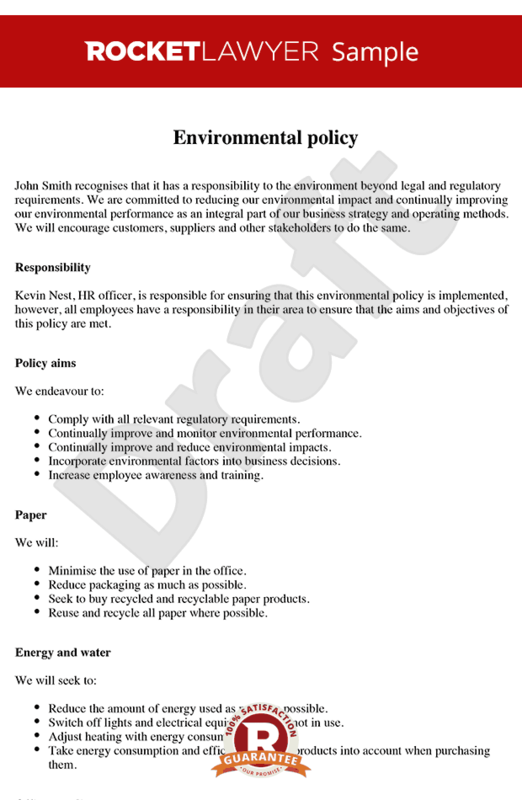 An environmental policy is an internal document setting out an organisation\'s environmental position and values. It outlines what are the environmentally harmful practices to avoid, and encourages environmentally friendly ways of working. Why do I need an environmental policy? A good environmental policy shows your business is committed to work in a responsible manner and to protect the environment. It ensures you stay within the law and monitor your environmental impact, and keeps employees informed about their environmental roles and responsibilities. How can a business reduce its environmental impact? Reducing energy use - turning the lights off when leaving office, or having energy efficient light bulbs is a good way to save energy. Reducing water use - checking for dripping taps and pipes or choosing an efficient flushing system in the facilities can reduce water use within the workplace. Minimising waste and recycling more - recycling bins or double-sided printing will help reduce the business\302\222 carbon footprint. Promoting use of non-motorised transport - if possible, encourage staff to walk, cycle or share lifts to go to work. For more information on how to minimise harm to the environment, read our Quick Guide on Environmental policies. How can I improve the environmental policy over time? Reviewing the policy regularly, in line with your business needs and regulatory requirements, ensures the policy is always up to date and consistent. Don\'t hesitate to get your staff involved in the reviewing and monitoring process, as this will raise their awareness and commitment towards environmental issues. How can employee awareness towards environmental issues be increased? All employees should get involved in the development and implementation of the environmental policy. Making your environmental policy accessible to everyone (eg on the business\302\222 website) raises staff awareness, and shows third parties how proactive your business is regarding environmental issues. Notice boards, staff meetings and intranet pages are also useful tools to communicate your environmental policy.
" created_timestamp: "2018-10-08 04:36:27.0" modified_timestamp: "2018-10-08 04:36:27.0" active: true created_by: 104 modified_by: 104 dcm_id: 358 url_slug: "Environmental-policy" meta_description: "This environmental policy can help you understand how your organisation impacts the environment and what you can do to reduce those impacts. " time_to_complete: "10 minutes"
An environmental policy is an internal document setting out an organisation's environmental position and values. It outlines what are the environmentally harmful practices to avoid, and encourages environmentally friendly ways of working. Minimising waste and recycling more - recycling bins or double-sided printing will help reduce the business carbon footprint. Reviewing the policy regularly, in line with your business needs and regulatory requirements, ensures the policy is always up to date and consistent. Don't hesitate to get your staff involved in the reviewing and monitoring process, as this will raise their awareness and commitment towards environmental issues. All employees should get involved in the development and implementation of the environmental policy. Making your environmental policy accessible to everyone (eg on the business website) raises staff awareness, and shows third parties how proactive your business is regarding environmental issues. Notice boards, staff meetings and intranet pages are also useful tools to communicate your environmental policy. More than just a Environmental policy template, our step-by-step interview and guidance makes it easy to create your document. Easily create online, download, print and sign your free Environmental policy in minutes. This document is also sometimes called: environmental statement.